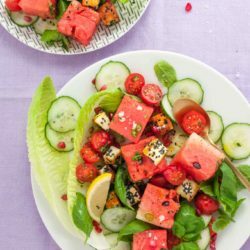 This halloumi watermelon salad recipe features hot, toasted halloumi crusted in earthy, nutty nigella seeds. Layered on sweet, fruity watermelon and herby salad, with pomegranate seeds, garlic, lemon and chilli. Absolutely packed with healthy summer flavour. This fresh salad is a huge plate of healthy zing. Savoury, spice and tart all balancing the fruity, refreshing watermelon – and a riot of colour to boot. Sprinkle the hot, nutty halloumi over the salad, toss with the lemon dressing and serve immediately. A summery, fresh halloumi salad with toasted halloumi chunks, watermelon, pomegranate, mint and tomato. A bright, healthy summer salad absolutely packed with flavour. Juice the lemon, add the garlic to the lemon juice and set aside for 20 minutes – this effectively cooks the garlic. When the garlic is ready, stir through the chillies, season with a big pinch of flaky salt and whisk in the oil. Cut the cherry tomatoes in half, thinly slice the cucumber, cut the watermelon into large cubes, deseed the pomegranate and separate the romaine leaves. Arrange the fruit and vegetables on the plates, scatter over the herbs and drizzle over the dressing. 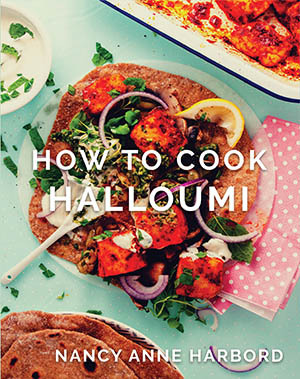 Set aside while you cook the halloumi. Cut the halloumi into 2cm cubes and pat dry with paper towel. Sprinkle the nigella seeds on a plate and press the halloumi cubes in the seeds on all sides – you won’t get a complete coating, but some of them should stick. Heat a little drizzle of oil (just enough to stop the nigella seeds sticking) over medium heat in a heavy frying pan until hot. Add the halloumi and cook on all sides, turning carefully, until nicely browned. Sprinkle over the salad and serve immediately.